Kapil Sibal's appearance alongside Anil Ambani in SC comes even as his party chief Rahul Gandhi has been attacking Modi for “favouring” Ambani in Rafale deal. New Delhi: For a good part of the last week, Congress president Rahul Gandhi has been keeping busy with his continuous attacks on industrialist Anil Ambani over the Rafale deal. On Tuesday, however, a senior leader of his party appeared for Ambani before the Supreme Court in a case. Senior advocate Kapil Sibal appeared before the top court, alongside Reliance Communications Ltd (R-Com) chairman Ambani, in a contempt case by telecom firm Ericsson India over R-Com’s failure to pay outstanding dues of about Rs 550 crore. “They are two difference cases,” Sibal told ThePrint. 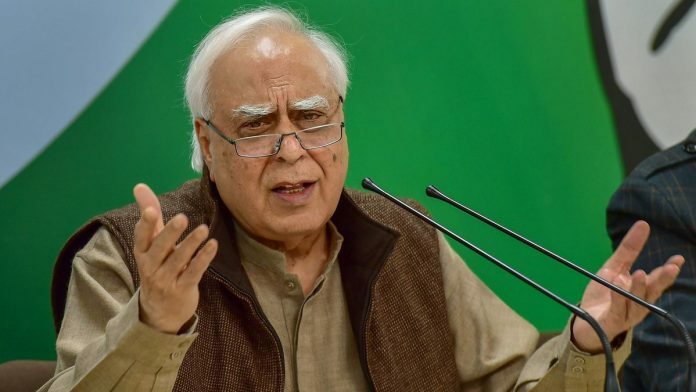 On Tuesday, Sibal tweeted about the latest development in the Rafale issue after a news report claimed that in March 2015, Ambani visited then French defence minister Jean-Yves Le Drian’s office in Paris and held a meeting with his advisors. This, the report said, came just a fortnight before Prime Minister Narendra Modi announced the procurement of 36 Rafale fighter aircraft from France. Earlier, Congress president Rahul Gandhi slammed the Modi government over the Rafale deal and accused the prime minister of putting national security at risk. This isn’t the first instance of Sibal putting his party in an uncomfortable spot. Amid campaigning for the 2017 Gujarat assembly elections, Sibal had urged the Supreme Court to defer the hearing in the Ayodhya title suit until after 2019 Lok Sabha elections as the verdict could have a bearing on the polls. The Congress was left distancing itself from Sibal, but Modi pounced on his remarks to make the Ram temple an election issue. Even recently, Modi accused the Congress of delaying the resolution of the Ram temple issue, indicating that his Bharatiya Janata Party (BJP) would continue to use Sibal’s stand in court to counter charges of the NDA government’s inaction on the temple. In November last year, even as Gandhi kept hitting out at Modi for “favouring” Ambani in the Rafale deal, Sibal managed to blunt his own party’s attack by appearing for the industrialist in a case related to selling assets of his company to his older brother Mukesh Ambani’s Reliance Jio Infocomm Ltd.
As the BJP criticised this, Congress maintained that Sibal had represented Ambani in his professional capacity. In April 2018, Sibal had also spearheaded the move to impeach then Chief Justice of India Dipak Misra. However, Rajya Sabha chairman M. Venkaiah Naidu rejected the motion for impeachment helmed by Sibal and signed by 65 MPs on the grounds that they were mere allegations. Sibal then favoured a petition moved in the Supreme Court by two Congress MPs against Naidu’s ruling. However, within a month, he withdrew the petition. In 2011, when the UPA was in power and Sibal was telecom minister, he had come up with the “zero loss theory” to rebut the Comptroller and Auditor General (CAG) report estimating the loss to the exchequer in the allocation of the 2G spectrum at Rs 1.76 lakh crore. The statement had added fuel to the raging 2G scam fire. To be sure, Sibal was seen to be vindicated in 2017 when a special court acquitted all the accused. Even before this column I myself had tweeted about why RG ,Cong. P’s campaign against AA in Rafale n his Sr. cong leader Kapil Sibbal defending AA in SC cud not go hand in hand.Bt is not clear why RG is not stopping this nonsense.Or it is acceptable division in Indian polity ? Congress should just show the door to Kapil Sibbal. If he is so starved for cases that he has to accept anything and everything that comes his way, then obviously he is bad at his job so cannot be relied upon for any legal advice. If he is so greedy for money that he cannot do even the minimum of sifting of clients who want to engage him, then he will surely bring bad name to Congress party if he’s ever given a post of responsibility. This man Sibbal should be just dismissed from the party. True. But a Lawyer also is expected to have a conscience. If he has to say something on behalf of his political party which is at variance with his professional responsibility, he should choose between the two. It is almost like Sheila Dikshith saying she was HONOURED to have Tytler at her function held to take over as Delhi Congress President. Can’t run with the hare and hunt with the hounds; at least NOT openly. Why it’s embarrassing ? When it’s his Job being lawyer to defend his clients . On other hand it’s totally different case than Rafale.